featuring a Guest Lecture by SPWS on 10/21, 8pm! In the first exhibition at Observatory, Brooklyn, on view through November 15th, James Walsh presents photos and prints in conjunction with an evening program of projections, performances, poetry, and other events by various artists throughout the run of the show. James’ thoughtfully installed work includes a series of letterpress prints based on John Ruskin’s journals, paired with photographs of details of cloud-painting taken from dioramas in the American Museum of Natural History. 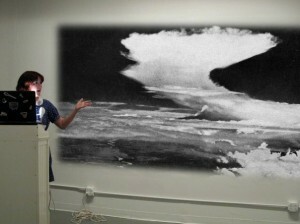 In both, he considers how recording the clouds is an act of both ‘objective’ study and ‘subjective’ projection. In conjunction with his show, James has invited a number of artists to reflect on this theme (in forms as varied and elusive as the clouds themselves!). 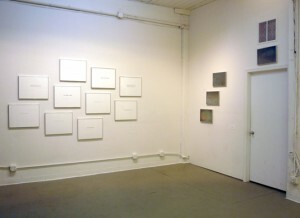 In the gallery, Jen Bervin presents a spread from her book a non-breaking space. A series of evening events has included a reading by Joshua Beckman (we were invited to bring pillows; Joshua read texts by himself and others as we lay outstretched, eyes on the ceiling); a lecture by Klara Hobza (a tour through modern cloud classification, with lots of pictures, and a summary of current cloud-making practice); and a slideshow of work by Pauline Curnier Jardin and Catriona Shaw (with excerpts of their work-in-progress, a cloud-opera). This entry was posted in Clouds, Events, Prediction. Bookmark the permalink.